Do you have questions about our Fronius inverters, or questions about solar in general? Give us a call at 1-800-472-1142. The Fronius Primo, with power classes from 3.8 to 15.0 kW, is the ideal residential solar inverter for your unique solar system design. With dual MPPT and a wide voltage window, the Fronius Primo offers design flexibility. The sleek inverter design features the innovative SnapINverter hinge mounting system and Wi-Fi enabled for easy commissioning and monitoring. 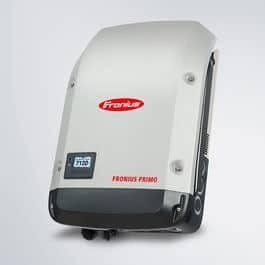 Many other features come standard in the Fronius Primo, including industry-leading Arc Fault Circuit Interruption, and free lifetime monitoring through Fronius Solar.web. The SnapINverter line is NEC 2014 compliant with the easy implementation of the Fronius Rapid Shutdown Box and has the technology for future code and consumer demands, while offering field serviceability for the most sustainable option. Extensive product line, accommodating a wide range of applications. A trusted name in the renewable energy field. High frequency/phase shift architecture maximizes efficiency while reducing weight. Headquartered in Pettenbach, Austria, Fronius has been a key manufacturer of photovoltaic electronics since 1992, particularly in the engineering and manufacturing of photovoltaic inverters for both grid-connected and independent power supplies. Fronius was founded in 1945, and began manufacturing battery-charging systems shortly thereafter. They made a name for themselves with premium welding technology, especially in the automotive industry. Eventually, technology and engineering standards used in welding applications transferred over to the solar electronics market. Production facilities have always remained close to home, nestled at the foot of the Alps, in Sattledt, and Weis in northwestern Austria, along with production sites in the Czech Republic and Ukraine. A state-of-the-art facility opened early 2011 in Pettenbach, reaffirming the company's commitment to the European union. Fronius has remained a trusted name in the renewable energy market, offering an extensive line of photovoltaic electronics, built to high quality control standards. Fronius' IG series of inverters offer residential & commercial grid-tie customers a wide range of products, which reflect the company's proven designs. Their wide input voltage range allows for flexible use of modules in any power and voltage range. These inverters come standard with 3 expansion slots, which allow you to add features like external sensors and remote displays. High-frequency (HF) architecture, and phase shift technology deliver higher reliability and efficiency while reducing size, weight, and installation costs. All Fronius IG series inverters are CSA listed to UL 1741 for the U.S and Canada, and are backed up by standard 10-year warranty with the option for a 5-year extension. The Fronius IG plus line offers customers more features for larger systems. These inverters provide a lockable, code-compliant DC disconnect with a six circuit, fused string combiner in a separable compartment that stays on the wall if the inverter needs to be serviced. A bus bar is available for bypassing the combiner on higher input currents, and the string combiner can be fused for up to 20 amps per circuit. Fronius IG inverters make a seemingly complex system appear simple and straightforward, maximizing ease-of-use and technological advancement.